A well designed bed is not just a beautiful addition to a bedroom. It is also essential to a good night’s sleep. People spend one-third of their lives sleeping, so you’ll want to get the best one for you; and it starts with good bed frame. Bed frames come in a wide range of style, size and material. From metal to upholstered frames, there are other things to consider when buying a new bed including size, comfort, materials and storage requirements. Standard bed frames are typically made of metal or wood, though recent trends show increase in popularity of other materials such as plastic. This guide will be focusing on wood as a material and the top ten products that are worth considering. We have also written a complete guide about best Bed Frames under 200. Every type of wood has a distinctive grain structure. It has small holes, or open pores on the surface, which gives it a distinct quality when used for furniture such as bed frames. When stained, the affected area’s color appears darker than the other parts. However, there are tighter grained woods, like cherry and maple that have smoother texture. 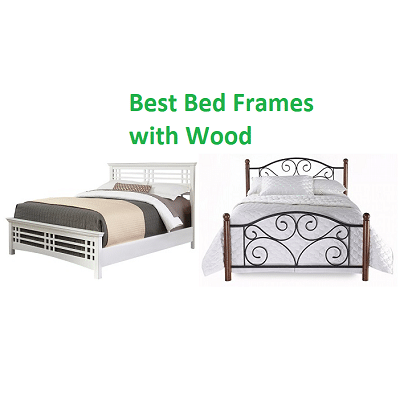 Why Choose the best bed frames with Wood? Durability: Wood has always been used in building furniture because of its durability. It is distinguished by its robustness. It can last for years, so it’s easy to find a bed frame that offers longer years of guarantee. It provides great support and robustness that gives a good value for your money. Versatility: Another important benefit of using wood is that it can be constructed in various styles. Plain, simple design can be made, while a more ornate look from carved wood can also be created. Various colors can also be chosen since there are different types of wood. It can be stained or bleached to change its color. Low Maintenance: Wooden bed frames require simple cleaning. With it, you don’t have to worry about rust. Even if it gets damaged over time, the imperfections can even make the bed attractive. To clean, you just need a damp cloth or use a special wood-friendly detergent. Most wooden beds are coated with varnish or other coating that protects the furniture. Wood can be categorized simply into two, hardwood and softwood. Note that this classification has nothing to do with the wood’s hardness or softness. In fact, hardwoods are actually flowering trees while softwoods are conifers. The latter also grows faster and is more readily available. Cedar: Cedar is often used for decorative panels and is brown to white in color. Outdoor furniture is often made of eastern red cedar that is naturally moth repellent. White Pine: Readily available and easy to use, this type of softwood is a popular material in earlier times. However, it is prone to swelling, warping and shrinking. It also wears over time because it is soft. Yellow Pine: This grainy wood is not ideal for exposed wood as it does not finish well. It comes in shades of yellow, orange and tan. Hardwood is often more durable and expensive than softwood. High quality wood in the market is typically a hardwood. Others go for a cheaper hardwood that’s stained to look like the more expensive ones such as mahogany. Birch: Birch wood has a light tan shade to almost white. It resists warping, swelling and shrinking and is easy to stain. It is used to imitate walnut, cherry or mahogany. It is difficult to use when you want intricate details, that’s why it is commonly seen on furniture with simple and contemporary lines. Cherry: Thought as the finest fruitwood, cherry wood features reddish brown color. It resists shrinking, warping and swelling. It stains well and is easy to carve, making it ideal for decorative work. Ebony: Ebony is brown to nearly black in color. To show its distinct grain, it is often dyed black. It is rare, very strong and dense. It is commonly used for inlays than full pieces. Mahogany: Mahogany is a popular wood for cabinetry and furniture for its excellent workability. It is durable, stable and resistant to decay. It does not swell, shrink or warp and is easy to carve. The color is from tan to reddish brown and darkens over time. Maple: Maple also offers a good quality wood for furniture for it is very hard and doesn’t wear, warp or shrink. It can be dyed but is difficult to carve. It is light beige to tan and comes from red, silver, black or sugar maple trees. Soft maple comes from silver or red maple trees and is not as durable as hard maple but can be stained easily. Teak: This wood is rich honey brown in color. It is durable and ideal for outdoor furniture and can last for as long as 50 years. Oak: Oak is liked for its bending quality and durability. It resists fungal and insect attacks and does not absorb moisture. It offers nice grain markings, that’s why it is best for furniture. Poplar: Poplar is light tan in color. It has pink or green streaks and is among the weaker hardwoods. Like teak, it does not shrink and is often used for furniture’s interior. Rosewood: Deep red in color, rosewood is easy to work with. It doesn’t warp, swell or shrink. Since it is rare and expensive, it is typically used as veneer. Walnut: Walnut is dense, hard and tight-grained. Dark greyish brown in color, it polishes to a smooth finish. It is often stained darker and resists wear, warping and swelling. Composites are wood products designed for specific purposes such as shelving or crafting of the backs of furniture. Plywood and particleboard are common types of composites. Plywood is made of glued and pressed layers of wood. Particleboard or chipboard is also a sheet of wood made from a mixture of sawdust, small wood chips and resin or glue. It is typically found under veneers and laminates. Veneers are thin slices of wood glued to a wood base or plywood. They can ad interest to furniture for they accentuate the grain lines of wood. Laminates on the other hand are applied over fibreboard or particleboard or other base material. They are smoother and easier to clean. Colorful ones are used for contemporary or children’s furniture. Beds come in a wide range of types. Here is a brief description of the common types. Four-poster beds: originally designed to hold hangings that provide insulation, four-poster beds have corner posts that can be simple to lavish. Tester or Canopy Beds: they are like four-poster beds but they have crossbeams that connect the four posts. The beams can be draped with light fabric. Sleigh: also called French beds, sleigh beds look like a sleigh for it has scrolled headboard and footboard. 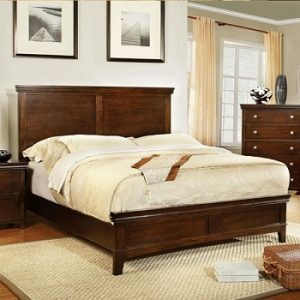 Low-post Beds: these beds have posts that do not exceed the height of the headboard and footboard. Posts can have a decorative finial, suiting different room styles. Daybeds: Daybeds are used as a sofa by day and bed at night. Bunk beds: Bunk beds feature a top and bottom bed designed to save space. Storage beds: Beds with drawers or sliders that provide additional storage to save space. 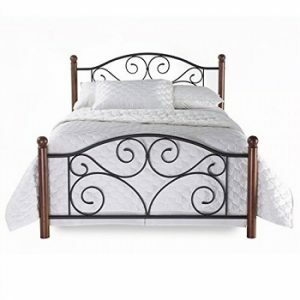 Bed frames or bed steads are commonly made of wood or metal. The frame consists of head, foot and side rails. Larger of heavy duty frames also include center support rail. These are assembled together to form a box for the mattress or a box spring to sit on. Beds do not necessarily have headboards or footboards. The rails can be made of wood and metal and attached to the headboard and footboard. Slats are placed perpendicular to the rails to provide support to the best latex mattresses or box spring. On the other hand, the bed base or foundation is the part that supports the mattress. It is held in place and framed by the bed frame. Box spring beds are common, though sprung slats are also used. Bed bases can come as a traditional box spring, an all-wood foundation and a grid-top foundation. An all-wood foundation often has about seven or eight slats disposed below beaverboard or paperboard. It provides support that is similar to platform foundation. A grid top foundation is a combination of wood and steel. There are numerous designs for beds available today. If you prefer wooden bed frames, you can find solid wood while others features a combination of wood and metal. Sometimes, the headboards and footboards are only the ones made of wood. Many metal bed frames also have wooden slats. Whichever is your choice, consider the quality of materials used. The best wooden bed frame is worth the investment. Aside from providing support to the mattress, it can act as a focal design statement in a bedroom. It can have elaborate headboards or footboards that bring life to a simple room. When shopping for one, there are things to consider including the room design, the space available, portability and budget. A bed frame to support your mattress is an important purchase. It should not just be attractive for it must also provide ample support and protection for you and your mattress. In buying a bed frame, slats are very important. They should be made of durable materials and should be closer together to protect the mattress. Room: It’s best to consider the bedroom where the bed will be placed before shopping for the bed frame. The bed should suit the room well. For instance, if it is for a guest room, you can go for a simpler or less fancy bed frame. Children’s rooms often have bunk beds that they enjoy. Determine the type of bed frame to by thinking of where the bed will be placed. Available Space: Beds can take so much space. Check the available space in your bedroom to determine the best size of bed frame to buy. If you have limited space, you can opt for space-saving bunk beds, daybeds or storage beds. Room Décor:The style and material of the bed frame should suitthe room decor. Wood is a versatile material since it can be constructed in various styles. Traditional styles include sleigh or canopy beds. Portability: a bed’s portability is another good consideration especially if you ought to place the bed in a temporary room. Avoid buying beds with large headboard or footboard if you live in a place with narrow doorways. Budget: Bed frames with wood come in a wide range of prices. Some can be inexpensive while others can be very pricey. When shopping for your bed, for sure you allot a certain budget, so stick to the products that are within your budget. Use: A few questions are worth asking prior to buying a new bed frame. Aside from storage, do you want a children’s bed that can last up to teen years? There are literally hundreds of bed frames with wood in the market. Do not let the wealth of choices lead to confusion. After careful research, we have analyzed, reviewed and ranked the top ten best ones. Hopefully, this helps narrow down your choice so you end up buying the one that best suits your needs and stays within your budget. 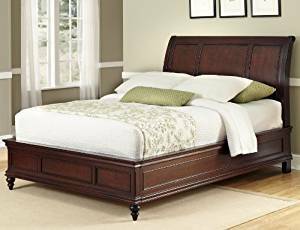 The Home Styles Lafayette King Sleigh Bed has a headboard that has been decorated with largely sized moldings. The bed is also slightly sleighed. Similarly, the rails, as well as the footboard, are also quite detailed. there are picture frame type moldings as well as spindle legs. The size of this immaculate bed is 78.75-inch wide by 94.75-inch deep by 53-inch high and it weighs 79 lbs. There is a high degree of the opulence of design in this bed and this goes to signify that this bed is indeed a part of the unique and special Lafayette Bedroom collection with all its associated allure. The Lafayette King Sleigh Bed by Home Styles shows the hallmarks of the traditional and ancestral designs the bed is embellished with Mahogany solids with cherry veneers blended in such a rich and opulent cherry finish that the whole design seems to be highly accented, articulate, ingenious and has elegant details epitomizing the workmanship of the designers and the artisans. The headboard is so impressive and majestic that it appears very stately. It is also decorated with large moldings and has been sleighed quite a bit. The overall look provided by this design to the bedroom is extremely lavish. The bed requires assembly before usage and assembly instructions are provided to the user. The bed is indeed stunning to look at. 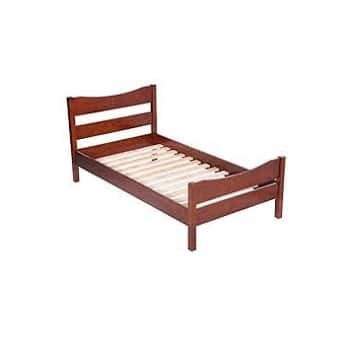 It is constructed very well and is a heavy bed providing safety and stability to the user. It can take different thickness mattresses depending on how comfortable the user wants the bed to be. First to make it on our list is a luxurious bed from Zinus, one of the leading manufacturers of high quality bed foundations. This tufted faux leather upholstered bed combines comfort and elegance in one package. Here, you get the sturdiness of thick wood used as slats and the strength of metal used as frame. It’s not just a lovely addition to your bedroom. It is the one that transforms it. You can buy the best memory foam mattresses separately. The platform bed comes in full, queen and king sizes and is designed for mattresses not thicker than 13 inches. The set includes the headboard, footboard and slats. With this bed, you will come home to a relaxing room and enjoy a good night’s sleep. You can use memory foam, spring or other types of mattresses that you prefer. You’ll love the clean look of upholstered faux leather. It is not just comfortable; it also makes your room classy. What’s even better is that it is easy to maintain. Just wipe it clean with a damp cloth or special cleaning agent. The frame is designed with exposed feet for added support, and you’ll be confident that it can securely hold any kind of mattress because the materials used are of premium quality. The package comes in one box and is smartly shipped. All parts are neatly placed in a zippered compartment at the back of the headboard. If sturdiness and sophistication is what you’ve been eyeing, then this bed frame is right for you. The manufacturer is confident with their product as proven by their long-term warranty. Sleep in style on the Dunhill bed frame made of solid wood and veneer. Featuring soft curves similar to traditional French style, this bed offers a refreshed classic look that makes it suitable for modern and country interiors. The headboard has two large panels while the footboard is low-profile in design. You’ll benefit from the durability of the hardwood and the pleasant look of the brown cherry finish. With his item, you get a nice bed at a friendly price. Available in California king, king, full and queen, this bed lets you choose just the right size for you. Dunhill is beautifully crafted from solid wood. The simple style makes it easy to match with your beddings and room decor. The relaxed cottage appearance features a nice frame with panels, scalloped tops and base moldings bathed in rich brown cherry finish, creating an inviting atmosphere. It seems like Dunhill has mastered the art of underrated elegance. Its appearance is easy to love and it makes the right statement whether you are leaning towards classic or contemporary. The transitional bed doesn’t just boast elegant design. It is built tough, strong and durable. The sturdy legs provide astounding support, making it steady and stable. Use it with your choice mattress, but it requires a box spring. You’ll surely be pleased with the bed’s quality and construction and you won’t find it difficult to assemble. It comes with an easy to read manual and the parts needed to put it together. Mattress and beddings are not included. Another platform bed from Zinus makes it on top of our list, and it’s easy to tell why. It’s their deluxe version of the faux leather upholstered bed. Padded for comfort and colored black for elegance, the bed is a celebration of uncluttered design. It displays modern upholstered platform bed that exudes effortless style, enhancing the look of a bedroom. Built from quality metal frame with thick wooden slats, the bed is a sturdy base for any type of mattress. The bold panel tufting forms the headboard and draws all attention. It is heavily padded for ultimate relaxation. Available in twin, full, king and queen, you’ll surely have the size that fits your needs. You can be confident of this bed frame’s stability for it has a center support with feet. If you want to move away from the box spring concept, this bed allows you to do so. As soon as it comes to you, you’ll notice how well packaged the bed is. Everything comes in one box, complete with all the pieces placed in a zippered pouch at the back of the headboard. The metal brackets are pre-installed for greater support, which will make you feel at ease knowing that the frame can hold up to shifts and weight. 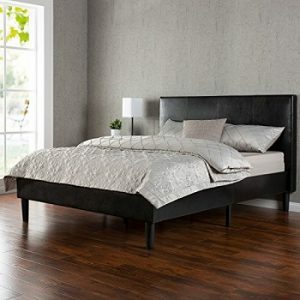 For its price point, this is an amazing faux leather bed you can use for a long time. Assembly time can take less than an hour, and the product comes with a 5-year warranty. The New Rustic Queen Industrial Wood and Metal bed – Includes Head and Footboard has been manufactured out of MDF panels that are of a high grade. The metal part has been coated with powder. 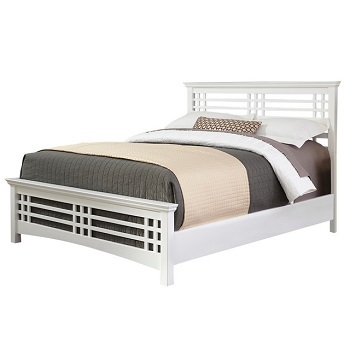 The bed includes the headboard, the rails, and the footboard. The bed requires mattress and bedding to be added to it before use. The product dimensions are 84 x 63 x 54 inches and the weight of this bed is 105 pounds. At the end of a long tiring day, this queen-sized bed is just perfect for a comfortable rest. The metal used in this bed is refined and it has been powder-coated. Similarly, the wood used in the bed has been engineered into an industrial design which appears to be rustic. 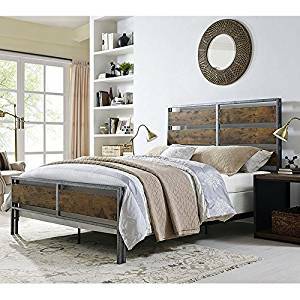 The New Rustic Queen Industrial Wood and Metal bed – Includes Head and Footboard serves as an impeccable and necessary addition to any bedroom at the user’s home. The bed has been constructed to be extremely durable, long lasting. The bed is shipped in a ready-to-assemble form and instructions for step-by-step assembly are provided to the user. The bed’s design is inspiring and it suits the fashion sense of many individuals who are design conscious and like to have a strong but still nicely crafted bed at their disposal. The combination of metal and wood make the bed very sturdy and strong but at the same time, the elaborate wood design is emphasized as well. The bed has a strong aesthetic appeal and would suit any bedroom in a user’s home. Easy to assemble with easy to understand instructions provided to the user along with the shipment of the bed. 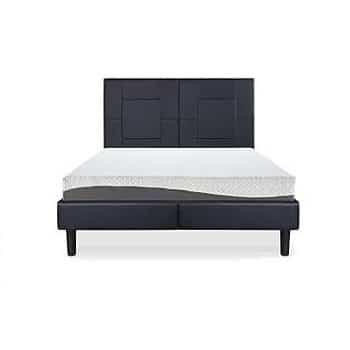 The Tvilum 76200/13cj Scottsdale Bed with Slats, Queen, Truffle is a Danish product which has been manufactured with PEFC Certified sustainable wood. PEFC is the world’s largest certifying organization. IT promotes endorsement program of forest certification as well as sustainable forest management. The user sleeps soundly and with style. This can be termed as the ‘city chic’ platform bed. It is from the Scottsdale Collection and all the Scottsdale platform collection beds serve as the main attraction in any bedroom. The construction of the bed is with composite wood. The headboard has been arched to give comfort to the user. It proves ideal for surfing the internet or reading while in bed. 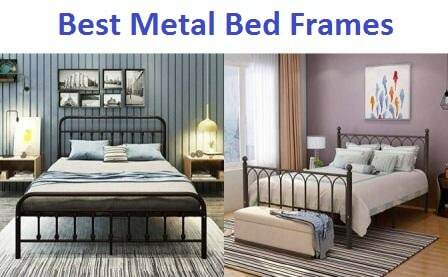 The frame of the bed is very strong yet it is simple enough to adequately blend with a lot of different room decors. It gives a very clean and suave ambiance to the room it is placed in. It has got a slight sheen because of its finish which gives it a contemporary touch. The bed is extremely easy to maintain. It can be cleaned with water and it is scratch and train resistant. This Scottsdale bed is ideal for college living as well as for families. The product dimensions are 89.2 x 62.6 x 41.2 inches and the weight is 172 pounds. The assembly instructions are easy to follow and are described in detail in the assembly manual. The bed can only be used with slats or a mattress with a solid frame. Placement of electrically adjustable bottom in the bed frame could cause fatalities. If required, instructions from electrical furniture manufacturer need to be followed. The assembly instructions are graphic in nature and can be understood by anyone regardless of the language he/she speaks. The manufacturer of the Tvilum 76200/13cj Scottsdale Bed with Slats, Queen, Truffle also provides a line drawing of the bed to facilitate the understanding of its design as well as its assembly. Rest well in this stylish transitional bed frame from Fashion Bed Group. Avery features tall, slatted headboard and low footboard, creating an inviting appeal that keeps your space light and airy. The warm oak stain finish is light, making it suitable with any decor. It is coated with clear lacquer to protect the wood and make it very easy to maintain. 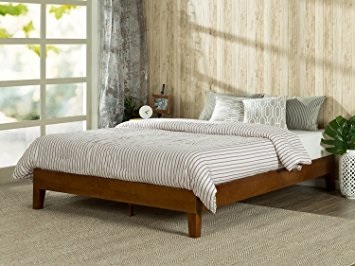 Classic mission style shows vertical and horizontal lines, a unique design that makes it a timeless bedroom piece. Inspired by the 20th century artistry, Avery bed was made of solid eco-friendly Plantation hardwood. The headboard and footboard are similar, with the former being highlighted, thus the size of 50 inches. The footboard is slightly curvy and measures 19.5 inches. It boasts solid support as provided by the cross slats, side rails and center support. This way, you don’t have to worry about the mattress to use or the weight of the person who’ll sleep on it. The high quality wood used on it is enough to make it sturdy and stable, no need for steel frame. The 7-step oak finish was hand applied, making the bed an interesting addition to an ordinary room. It also easily matches with other furniture. The bed may be reminiscent of the past, but it sure can complement any bedroom style in the coming years. With its 10-year warranty, the bed frame proves to be well-built. For its beauty and value, you’ll certainly appreciate the craftsmanship. The company is known to produce fashionable, high quality beds for long term use. The package comes complete with all the parts needed as well as instructions and hardware bag. The Bedford bed frame brings warmth and complements any room style. Breathe new life into your master bedroom with this rich ebony finished bed frame. Featuring raised panels on the headboard and footboard, this frame is accented by clean lines and beautiful details. Though simple in design, the tall headboard definitely enhances its look. Seems like the manufacturer knows how to stay on top of the trends with the right mix of innovative style and finishes to consistently provide quality crafts at a reasonable value. Black has always been associated with elegance, and this bed frame is a proof of that. Paired with other black furniture, your bedroom can be a picture of sophistication. Bedford is made of hardwood and wood veneer, ensuring durability and strength. The finish is easy to maintain; just wipe it clean with a dry, soft cloth to remove dust. It is available in king size, so it is perfect for a master’s bedroom. Couples looking for the right bed can also consider this well designed bed that’s easy to match with their preferred mattress and bedding. This bed frame is well built and sturdy. You’ll love the details on the headboard, as well as the nice size that’s great for accompanying more pillows. It has three slats that connect on the sides at the bottom to support a box spring and mattress. There are adjustable height knobs on each slat that support the legs. If you’d like to upgrade to a king-sized bed, this product is definitely worth the price. You even won’t have difficulty putting it together. Add an urban touch to your bedroom with the sleek and contemporary Divano Roma tufted upholstered platform bed. Featuring an English style headboard and dark gray fabric, your bed is a fusion of modern vibe and relaxing warmth. The frame is exquisitely crafted with high quality wood and composites and covered with durable linen. Available in full, king, queen and twin sizes, this tufted bed frame has just the right size for you. It is built with couple of different materials. The main frame consists of hardwood while the slats are all constructed with thick wood. There are 12 legs made of composite materials for greater support. Assembling the bed is not difficult for when you have all the pieces removed from the package, it will take you less than an hour to put it together. If you prefer upholstered bed, this bed frame works for you. Some people prefer linen rather than hard or leather finish because it exudes warmth and comfort in a bedroom. This perfectly describes this Divano Roma bed; and with its dark gray color, your room can become a luxurious suite. Even if it’s made of fabric, the color is not hard to maintain. When it comes to sturdiness, you can be confident that this frame can hold your mattress well. It is designed to go with any kind of mattress without the use of box spring. The space underneath allows storage for some of your belongings to reduce the clutter in your room, which is great if you are short of space. You also won’t have to worry about matching it with your bedding of choice or your other furniture since the color is neutral. A stunning upholstered bed at a reasonable price is a wise investment. This Sleeplace bed frame might be the bed you’ve been wanting for your master bedroom. It features contemporary design, sturdy materials and excellent support. 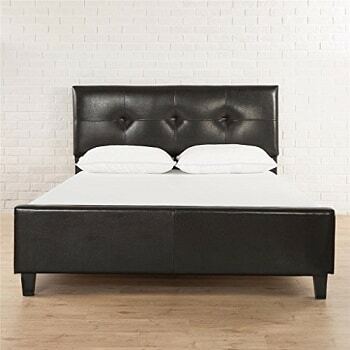 The tall headboard is made of high quality faux leather matched with low profile footboard. The frame is constructed with various materials. The main frame is made of steel, while the slats are made of wood. It boasts sturdiness and excellent support for it is designed with 2-inch reinforced wood slats that can hold up to 1200 pounds weight. You’ll also love the smart structure of this bed for it is constructed to bring a good night’ sleep as it is very quiet. Some people are particular about the noise of bed, but this one delivers well for it makes no squeaking sound. 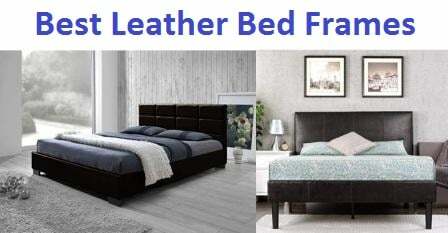 If black leather upholstered bed is what you fancy, this product is worth considering for it belongs to a low price point. You’ll get the elegance of black and not worry about comfort for it is well padded. In terms of sturdiness, it is guaranteed to hold mattresses well. Whether you want latex, memory foam or other types of mattress, this is stable enough for the mattress to sit on. It’s perfect for a bachelor’s pad or a couple’s master bedroom. Looking for a quality bed that stays within your budget? Zinus 12-inch platform bed could be the one for you. This one is another comfort innovation from Zinus. It might not be a luxurious bed, but you’ll want to have it for its sturdiness and versatility. It is simple, yet it works well with any style of room. The bed frame does not come with a lavish headboard or footboard, but it can hold up to 500 pounds of weight. 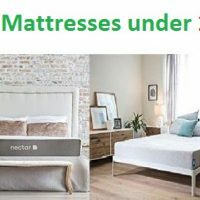 This is not surprising because the frame is made of solid rubber wood and strong slats to support any kind of mattress. 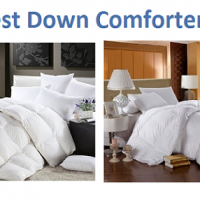 You can match it with memory foam, latex or spring mattress. The slats are about 2.5 inches away from each other, so you can be sure that your mattress is protected. Since it is a platform bed, there is no need to use a box spring. The height is 12 inches, which means you can store some of your stuff underneath. There are two additional legs in the middle for extra support. Assembly is also a breeze for the product comes with an easy to read instruction manual. So if you have been eyeing for a simple, sturdy and reliable bed frame, go for this platform bed from Zinus. The user makes a fashion statement by placing this WE Furniture Queen Size Metal & Wood Plank Bed, Brown in his/her bedroom and it accentuates the design of the modern bedrooms. The design is such that it wouldn’t look odd even in a traditional bedroom setting. The bed is extremely sturdy and strong as a result of the powder coated metal surfaces. the polished and metallic look adds to the aesthetics of the bedroom and enhances the ambiance of any bedroom it is placed in. 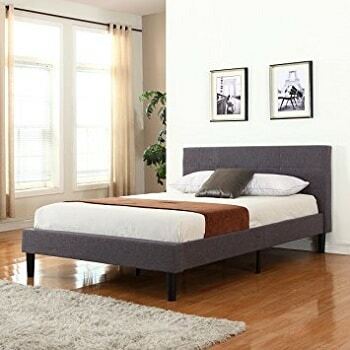 The bed frame, the headboard, and the footboard are extremely easy to put together and once assembled the user can feel the sturdiness of the assembled bed. The bed also has an awesome look. The height of the headboard and the footboard are such that they would suit the taste of a good number of people. The footboard is not too high and the headboard seems to have just the right height as well. For ordinary heightened people, the headboard would stay above their heads as they sit on the need which is the likable position for most people. The height of the headboard and the footboard is just ideal for most people with average heights. Various different mattresses and beddings can fit this design to enhance its aesthetic looks. Available in one size only which is the Queen size. 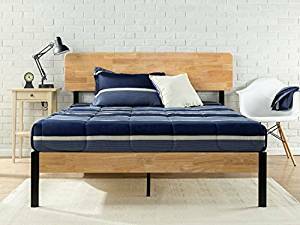 The Zinus Tuscan Metal & Wood Platform Bed with Wood Slat Support, Queen has got its uniquely modern and updated styling along with a sturdy and strong wood slat support. The headboard is made of wood and the frame is made of high-quality steel. All the three items ice. the headboard, the slat, and the steel frame are a part of this package and are sold along with the bed. The mattress, however, is not included and has to be purchased separately. The steel frame has been supplemented with a foam padded tape to make sure that the noise does not disturb the user. The movement of the mattress on the slats is restricted with the use of a non-slip tape on the wooden slats. The bed is sturdy and durable enough for the manufacturer to offer a 5-year limited warranty. The Product Dimensions are 80 x 60 x 14 inches and the weight of this bed is 76 lbs. The Zinus Tuscan Metal & Wood Platform Bed with Wood Slat Support, Queen is ideal for those who are planning to get their bedroom renewed. The headboard with the finishing done in wood as well as the metal frame accentuation would provide a great value for every dollar spent. The spring mattress or foam mattress, regardless of the mattress type are ideally placed on the slats which are made of wood. The mattress could be latex or hybrid a well. 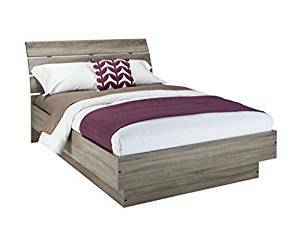 This Zinus Tuscan Metal & Wood Platform Bed with Wood Slat Support, Queen is able to blend very well with all of them in design and they all fit well in this bed. The package is shipped as a single carton. There is no need to add a box spring. The Zinus bed provides the right type of strong and sturdy yet nicely designed support for all mattress. Supports mattresses of all types of foam, spring, latex or hybrid, etc. Another bed from the Fashion Bed Group makes it in our list. It might be on the bottom spot, but it certainly could be on top of your choices especially if you are searching for a timeless, elegant piece of furniture to form a calming oasis in your home. 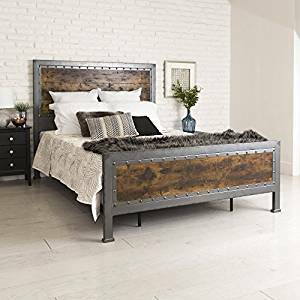 Designed with matte black finished metal headboard and footboard and dark walnut wood posts, this is sure to be a wonderful addition to your sanctuary. Built with carbon steel for strength and stability, the lovely curved top and classic grill design is the highlight of the 51-inch headboard and 31-inch footboard. The solid wood bedposts are sturdy enough to provide additional support. The grills are finished in textured matte powder coat and colored black to create a neutral base for your room. This is perfectly complemented by the walnut finished bedposts. The bed is engineered well, consisting of cross arms, iron rails and feet for full support to the mattress and box spring. The classic, transitional style offers calming simplicity and timeless elegance. It is great for your master bedroom or guestroom. You won’t have any problem assembling the package, for it comes with clear instructions. The manufacturer is very confident with their product as it comes with a 10-year warranty. What’s really surprising is that the bed looks like a very expensive one. In reality, it costs less than $200. So, if you are looking for a luxurious but budget-friendly bed, this is perfect for you. This platform bed foundation from Merax is a basic frame with a simple headboard and footboard. It is minimalist in design, so if you want something that is not too lavish or you are looking for a bed to place in your guest room, this one is excellent. It can match any decorating style since it features classic wood finish. What’s great is that you can choose from three different colors of finishes, so you can have the right one that suits your room decor. You can use the best hybrid mattresses for this frame, which are sold separately. Merax features a classic style, which is great if you fancy something that is traditional. Since wood is a timeless material, this bed frame suits you well not just for its look but also for its quality. It is made of 100% pine wood, and comes in espresso, walnut and white. It is entirely made of wood, and the support comes from wood slats as well. The slats are thick and appropriately spaced for your mattress to sit on. It can support your memory foam, latex or spring mattress. The headboard is 35.5 inches in height, while the footboard is 23.4 inches. Under-bed clearance is 8 inches, so there is enough space to place some of your clutter. The bed is quite small, measuring 78 inches long, 41.5 inches wide and 35.5 inches tall. This size makes it ideal to use for your child’s room especially if you are choosing the white frame. It is also perfect for a small guestroom. The package comes complete with all the parts needed to put it together. It might take you about an hour to assemble the frame. It holds up to 400 pounds weight. This bed is absolutely a good buy considering the price and performance.